What I expected when receiving the machine, was to have some simple examples to try out, like a name plate for carving, and small flower pot to print, the dice to do the laser carving. In the end, you have made this during your advertisement, so somehow you should have these items coded in some kind of software right? Sorry if I am wrong and I might not understand this all. png (convert to .svg), .svg. The online manual will include instructions for this feature soon. Stay tuned. CNC vector contour is similar to laser vector contour. The CNC vector cutting feature will be released soon. However, CNC is much more dangerours than laser. We have to do thorough test first. Also, from now on, this topic will only for Updates of the software. If you need to report bugs or discuss the functions of Snapmakerjs, please go to the corresponding topics under this category. Thank you! @harmerds Check new feature out. It would be great to get your feedback ^_^. 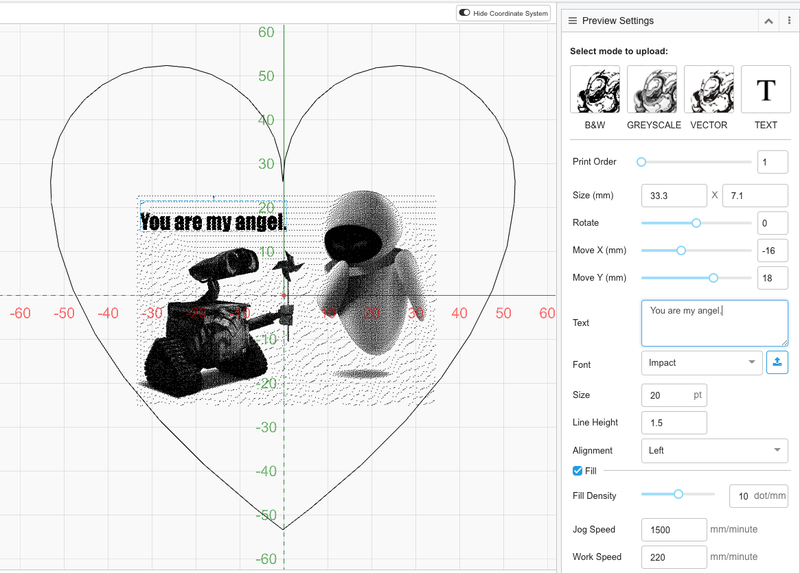 New Feature: Supports simple CNC Carving. You can import SVG images and the Snapmaker can carve following the vectors. The console keeps switching between Laser and CNC. New Feature: Add instructions for user inputs. CNC: G-code is upside-down when Clip is not selected. note: sudo snapmakerjs # Must use sudo or serialport can’t be accessed. Migrated Snapmaker3D into Snapmakerjs. 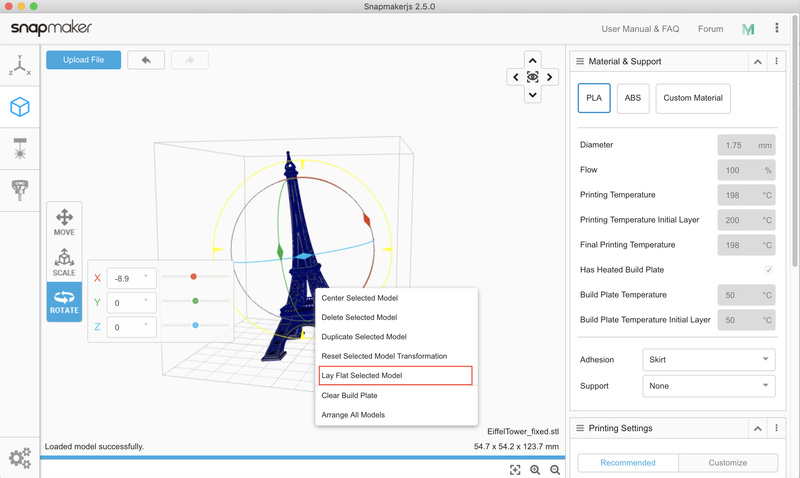 Now only one software is needed when using the Snapmaker 3-in-1 3D Printer! Fixed the bug that Laser widget is unable to set power when click “Set”. Now the power of Focus is changeable. You can set the power of Focus using the Power slider. Reworked the SVG parser. Now you can laser engrave text or image with fill. On Laser G-code generator, added the “Fill Density” parameter to set the engrave density for fill. When loading the G-code that is generated from the laser greyscale mode to workspace, the G-code can be correctly rendered. No more black blocks. Added 8 more common languages including German, Spanish, French, Italian, Russian, Korean, Japanese and Chinese. Better preview results when generating G-codes for laser engraving and CNC carving: when clicking “Preview”, the software will apply parameters directly on the image to make the preview closer to the final result. Added Pause and Resume feature. This feature is available only when the printer is printing using the USB cable. Added the “Lay Flat Selected Model” feature. Go to Settings → Enclosure → Door Detection and turn it on / off. Bugfix: Fixed Linux image upload issue across different partitions. Added Camera Aid Background to accurately place the image to be engraved on the material. Please click the below icon for the instructions. The language of the software can’t be changed to Korean. April 3 Update: There is a big bug in this version, please download v2.5.4 directly! Added an option to switch between automatic preview and manual preview. Turn off automatic preview can reduce memory usage and time for calculations when generating G-code from big images. Added parameter “invert” for laser B&W and Greyscale modes. It can invert black to white and vise versa. 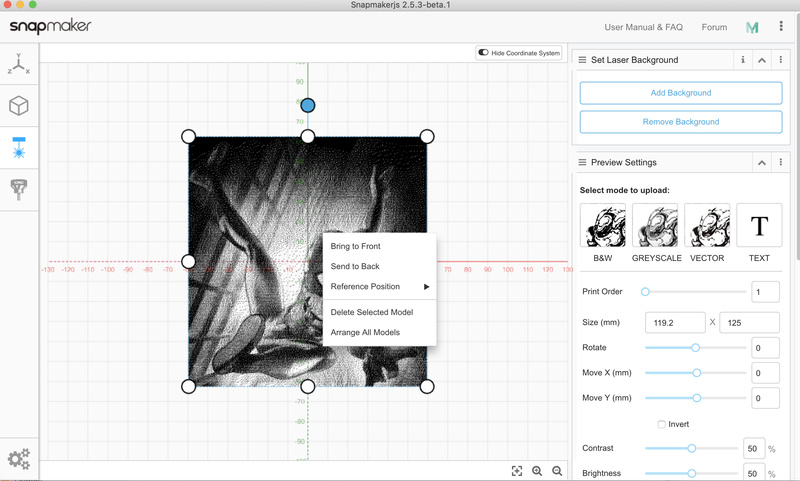 Added the ability to modify the dimensions of your workspace. Well you know, Snapmaker 2 have 3 models with 3 different sizes. 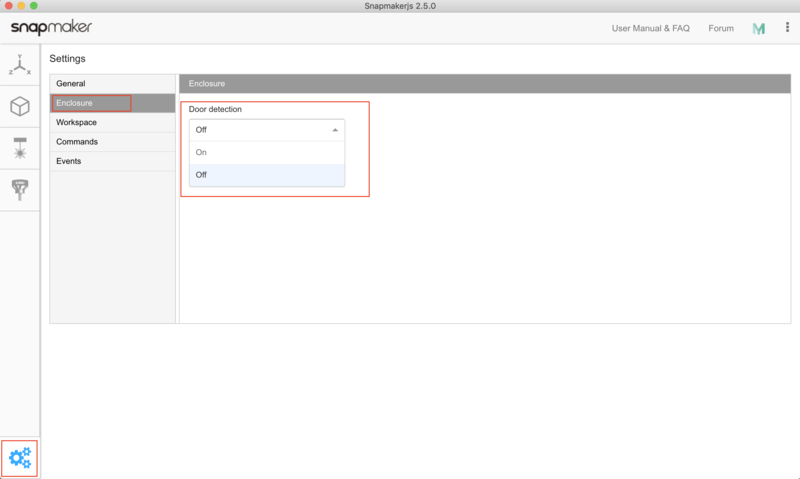 Fixed the issue that Workspace is unable to upload G-code file by drag and drop. 3D Printing slicing for 32-bit computers are no longer supported.